What was in that mono green deck that came second today? I've seen the list around but can't track it down. Link me to a decklist? Post subject: Re: Eldrazi Beast? No idea about the sideboard. Probably River Boas, Vines of Vastwood, Mold Shamblers, Great Sable Stags? Im glad to see this deck as #2 tho, I cant see myself playing U/W for 8/9 rounds *3 games. This one caught my eye 2 weeks ago because its fun to play. No snaplands to abuse it. The deck was running was similar to the last one on the list. I sat and watched a couple games. Had Master of the Wild Hunt. Think I saw Monumentus Fall. Pretty sure he had Pelakka Wurms in the sideboard. There were Mold Shamblers in side. Probably had Stags as they're not terrible against Jund. I don't really like the R/G one- I don't own the lands for it. Note: -1 Forest, -1 Wolfbriar, +2 Garruck? Shambler - Can hit Planeswalkers. Stag - Good against both Blue and Jund. Last edited by Obeisance on Sun Jun 13, 2010 10:42 pm, edited 1 time in total. you could ask the guy ~~. anyway this deck is supposed to win turn 4~5 that's why it uses lotus cobra. mold is great but it cost so much mana so is pelakka wurm (rather have giganta form.). Dont u guys get to see top 8 decklist? Or are deck list just published only at one of those super tournaments with the good players? I scrubbed out in big way. Round 1 - G/W something. Crushed him 2-0. Round 2 - Jund. Crushed him first game. Second game I got him down to 5 with a bolt in hand, I made a mistake and he turned the tide; I failed to draw burn as well. Game 3... mulligan to 4 is auto lose. 1-2. Round 3- Vampires. Game 1, he got manascrewed and I destroyed him. Game 2, I drew junk and died to Knights and Hexmages. Game 3, I beat him down with Jigglypuff. Round 4 - Jund. Repeated mulligan/bad hands = lose. 0-2. Round 5 - U/W control. First game, he drew heaps of removal. Game 2, I got him down to 1 life before Baneslayer started swinging. 0-2. Round 6 - Jund. Where was my luck earlier? Drew two good hands and had the games done in 10 mins. 2-0. The day was simply a case of me getting terrible opening hands and having to repeatedly mulligan into more crap. I managed to pick up all 4 Kargans. Got a Sarkan in booster prizes. And as for ask him- nah. I'm not going to copy his deck. He came 2nd with Beastmaster- more power to him. I'm just going to alter a netlist and play it because it's so stupidly cheap to build. 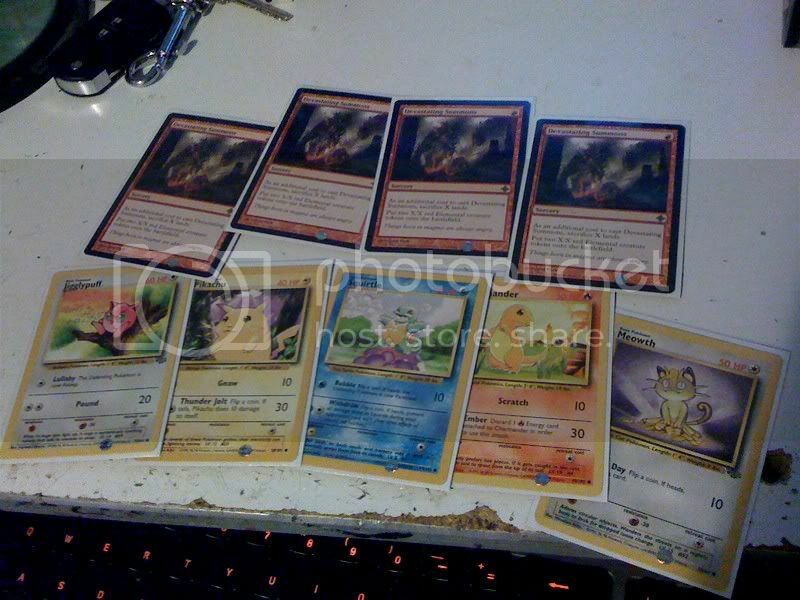 It's all $2 rares- side from Monument. I've got a foil Kargan for trade- for another Kargan and something else. lol. sure! I can get a karagan non foil from trade, then i'll add something for the foil D; what do you want? Starcity's selling Kargan for $15 and foil Kargan for $25. I need stuff for my black/red deck, it has priority. Maindeck, I need.. 3 Black Knights, 3 Terminate, 4 Blightning, 3 Siege-Gang Commanders, 3 Lavaclaw Reaches, 4 Dragonskull Summits. Side, 3 Slave of Bolas.